In this article it is proven that ultrasound can be used to harvest microalgae. The separation process is based on gentle acoustically induced aggregation followed by enhanced sedimentation. 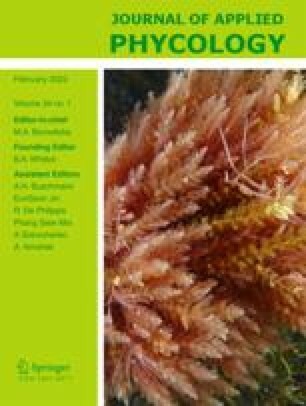 In this paper, the efficiency of harvesting and the concentration factor of the ingoing biomass concentration are optimized and the relevance of this process compared to other harvesting processes is determined. For the optimisation, five parameters were modeled simultaneously by the use of an experimental design. An experimental design was chosen, because of possible interaction effects between the different parameters. The efficiency of the process was modeled with a R-squared of 0.88. The ingoing flow rate and the biomass concentration had a lot of influence on the efficiency of the process. Efficiencies higher than 90% were reached at high biomass concentrations and flow rates of 4–6 L day−1. At most, 92% of the organisms could be harvested and a concentration factor of 11 could be achieved at these settings. It was not possible to harvest this microalga with higher efficiencies due to its small size and its small density difference with water. The concentration factor of the process was modeled with a R-squared of 0.75. The ingoing flow rate, biomass concentration and ratio between harvest flow and ingoing flow rate had a significant effect on the concentration factor. Highest concentration factors, up to 20, could be reached at low biomass concentrations and low harvest flows. On industrial scale, centrifuges can better be used to harvest microalgae, because of lower power consumption, better efficiencies and higher concentration factors. On lab- or pilot-plant scale, an ultrasonic harvesting process has the advantages that it can be operated continuously, it evokes no shear stress and the occupation space is very small. Also, when the algae excrete a soluble high valued product this system can be used as a biofilter.